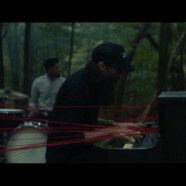 Crowder has released an emotional new music video for his song “Red Letters,” the first single off of his upcoming record, I Know A Ghost (sixstepsrecords/Capitol Christian Music Group). Directed by Patrick Tohill, the video brings vivid artistry and imagery to an already well received single. Watch HERE. In addition to the release of Crowder’s video this week, another brand new track, his gospel-infused song “Let It Rain (Is There Anybody)” [feat. Mandisa] is available on all music platforms today. Crowder’s highly-anticipated album, I Know A Ghost(sixstepsrecords/Capitol Christian Music Group), is set for release on Friday, Nov. 9th. The album pre-order is available HERE.The music video for “Red Letters” was inspired by Louis Klopsh’s statement in the introduction of his innovative Red Letter Bible – “It sheds a new radiance upon the sacred pages, by which the reader is enabled to trace unerringly the scarlet thread of prophecy from Genesis to Malachi. Crowder’s unique ability to continually create music that is original, inventive and future oriented while still retaining an accessible familiarity has fans counting the days until release. His musically adventurous spirit delivers a genre bending 16 track album (15 of which Crowder co-wrote). The album spans a modern blend of bluegrass, hip-hop, pop and EDM. He stretches musical boundaries with Latin influences in songs like “La Luz,” he brings Appalachian instrumental textures with porch-playin,’ beat-stomping songs “Child Of God” and “Happy Day,” and he draws the listener in with the ear-bending, gospel-infused “Let It Rain (Is There Anybody)” [feat. Mandisa]. I Know A Ghost is the follow up to his chart-topping record American Prodigal, which debuted at #1 on the Christian and Gospel Album charts and at #5 on Billboard’s Top Albums chart. This spring Crowder will be joining MercyMe (of I CAN ONLY IMAGINE fame) for a nationwide tour of over 30 dates.